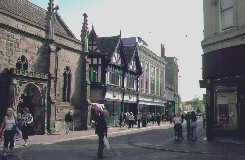 The Jewish Community in Hereford (England), up to 1290. This history of Hereford Jewry is taken mainly from the work of Joe Hillaby, a foremost expert on Medieval Jewry. The story was published as a series of Articles in the Woolhope Club Transactions (vol XLV 1985/87, 1982/84 and XLVI 1988-90) Other material comes from "The Jews of Britain" by Pamela Fletcher-Jones. All of these volumes are available in the library in Hereford. Other information comes from "The Anguish of the Jews" by E H Flannery (See Books) and the BBC Radio 4 series, "Jewish Journey" . We are most grateful to Mr Hillaby for his permission to publish this brief history. The full story is well worth reading, and Hereford Jewry appears to have fared better than most others, but its history gives a taste of the times. During the reigns of Henry III and Edward I, the clerks of the Exchequer of the Jews at Westminster produced a mass of records, in which the lives and tribulations of the Jewries can be traced in detail which is surprising for the time. The Hereford Jewry was one of no more than 13 recognised continuously through 13th century, but it was the second most important in England. Towns as far afield as Devon and southern Ireland took their government from Hereford. 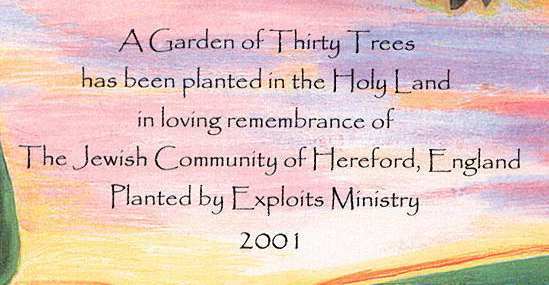 The first Jewish settlement in Hereford was in 1179, but it remained small and isolated for 30 years. Hereford had the three essentials for success - a royal castle, an adequate hinterland (large in Hereford’s case) , and a sheriff who exercised direct authority over the Jews and was responsible for their security in time of trouble. Hereford’s Jewish community flourished from 1218, under Hamo and his family (one of wealthiest in land) (Jewish wealth was overwhelmingly from money-lending, largely to country people). The family line passed to Ursell until 1241 and Moses until 1253. Moses died and family sank into insignificance due to royal pardons to their debtors. 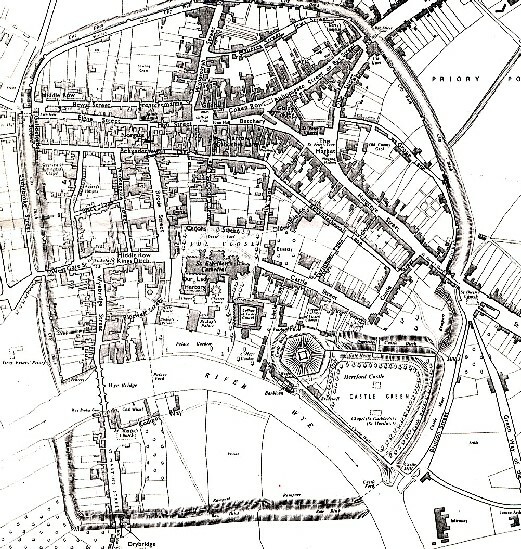 From 1260 to expulsion of 1290 Aaron le Blund, from London, dominated the Hereford community. Some of Hereford’s Jews had moved from Oxford because of rising anti-Semitism. Dominican friars had a priory in Jewry aiming to convert Jews. In 1222 a deacon adopted Judaism, was circumcised and married a Jewess. He was handed over to the secular authorities and burned at the stake. Hereford was different from any other Jewry in remaining on war footing after end of civil war in 1217 due to conflict with the Welsh. At the end of the civil war in 1217 Walter DeLacy, the sheriff, was looking to revive the economy. One measure was to reassure English Jewry who had survived the tribulation of John’s reign, especially because of the rising Anti-Semitism (preparation for Crusades) being preached by the Pope in 1215. By 1223 Henry III was in dire need of cash and squeezed Jews who owed him money. In 1220 – 1223 the DeLacys lost status and money in battles and Hamo’s family lost with them. The Jews were unable to recover the money owed by DeLacy as in Dec 1233 the king agreed to DeLacy’s request that money borrowed from Ursell should be postponed. In fact it was never repaid. The 13th century was a time of crisis for the knightly class. This was due to a number of factors - inflation in the early years, the ever-increasing sophistication and thus expense of military equipment and castles, as well as the temptation associated with the more general availability of luxury goods. Many knights turned to the Jews for money, but loans had to be secured on their one realisable asset, their lands. Aaron continued to suffer from the crown's fondness for rewarding faithful service by pardoning debts owed to Jews. Forced "contributions" were extracted from both individuals and the community. Moses of Hereford "contributed" £3000 towards the building costs of Westminster Abbey. In order to pay for some Christian religious objects, one Jewish community had to sell some of their Torah scrolls! The Statute of the Jewry, 1275 enacted that no Jew should lend anything at usury and any Jew found negotiating bonds would be punished. When the anti-Semitism associated with wide-ranging charges of coin-clipping swept the English Jewries between Easter 1276 and May 1279 the evidence suggests that Hereford was little affected, but simultaneous house-to-house searches were made of all the Jewries. Many were arrested and 269 Jews and 28 Christians were executed in London for coinage offences. Spectacular Jewish marriage celebrations took place in Hereford in August 1286, Aaron was the only member of the community who could have afforded an occasion of such splendour. This was the day that all Jewish parents waited for, with as much hope as the peace or turmoil of the times allowed. Such occasions were always important and marked by an elaborate procession, music, wit and uproarious merrymaking. The Church was not happy that Christians were invited and threatened any who attended with excommunication. Even so, there were those who joined the procession and festivity. They must have found it hard to resist such an opportunity - not merely for display, but to humiliate Richard Swinfield, their bishop. They were excommunicated. Thomas Cantilupe, 1275-82, is a revered figure in Hereford history but he has been described as 'an inveterate enemy of the Jews.' He received Edward l's special permission to preach to them in an attempt at conversion. On another occasion, when it was proposed that a Jewish convert should be appointed one of the commissioners to investigate the charges of coin-clipping, the thought of such a person sitting in judgment on Christians moved Cantilupe to an hysterical outburst in the royal council. With eyes full of tears he threatened immediate resignation, and Edward I capitulated. This incident was later brought forward as a proof of his sanctity. Fortunately for the Hereford community, Cantilupe was not often in his diocese and avoided both city and citizens. In 1287 all the Jews in Hereford were imprisoned again. In 1290, Edward I sent secret orders to the sheriff that all Jews, with their wives, children and chattels, were, on pain of death, to quit the realm by 1 November, the feast of All Saints. The sheriff was to ensure that they suffered no injury, harm, damage or grievance in their departure. The penalty for any Jew who remained behind after that was death. Paris was the goal of the wealthiest, but in February 1291 Philip the Fair expelled all English Jews from his lands except those profitable to the French crown . It is not known what became of Hereford's Jews. English medieval Jewries were not ghettos. 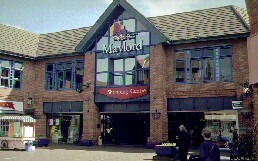 1 Jewry Lane - centre of the community. 4 Bewell Spring -site of mikveh? 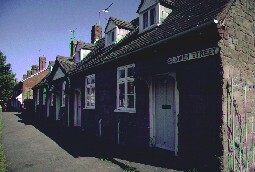 5 Bye Street - home of Manasser and house in dowry of daughter of Hamo. Archaeology has not produced much evidence but records can tell us quite a lot. After the expulsion, Reginald Moniword and William de Pedwardyn bought up Aaron's house, the synagogue and most of the other property in Hereford. The cemetery was incorporated into St. Giles' Hospital. Thus ended the 110-year-old community cherished first by Hamo and his family and later by Aaron. The community was remembered in common usage of place names for six centuries. It is in our own time that the site of the Jewry has been wittingly destroyed. The picture shows the site of Bye St Gate - one end of Jewry Lane. It will have been soon after his arrival that Hamo founded his Hereford synagogue. From earliest times the provision of a synagogue and its embellishment had been regarded as a duty of the wealthy members of each community. Founders' names were recorded in dedicatory inscriptions. In the expulsion inventory we find 'the community paid Is. a year for a 'synagogue with shop adjacent of the yearly value of 4s. . Sadly, the precise location of the Hereford synagogue is not evident from the records now available, although the site was remembered for many centuries after the expulsion. The building of a synagogue, even in the 1220s, was not an easy matter. In 1222 the Canterbury provincial council sought to prohibit the erection of new synagogues. Not to inflame public opinion, synagogues were frequently erected away from the public gaze, to the rear of the houses, in private courts. Indeed, the Statute of the Jewry, 1253, enacted that Jews must 'in their synagogues, worship in subdued tones ... so that Christians hear it not.' The London synagogue was handed over to the neighbouring friars because 'the constant wailing (ululatum) of the Jews impeded their rites. There is strong evidence of those who served in the Hereford synagogue, which formed a communal complex. Here would be found not only the schola but such other essential buildings as the communal oven, for the baking of the Passover mazzot, and the ritual slaughterhouse. In addition there would have been a community kitchen, with its cauldron used before the passover feast and other ceremonial occasions, a well and bathhouse. It is believed Hereford had a mikveh, the ritual bath. These were frequently of great depth as they had to be fed by a natural spring. Some six medieval mikveh are known in Germany. At Worms nineteen stone steps give access to the entrance hall and a further eleven to the mikveh itself. It is possible that the Hereford mikveh was located to the north of Bewell Street, only a hundred yards or so from the western end of Maylord Street. There the requisite mixture of rain and added drawn water could have been easily obtained. 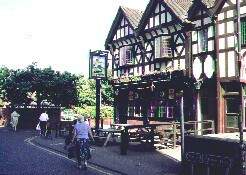 Bowling Green public house, Site of Bewell Spring & possibly, the Mikveh. 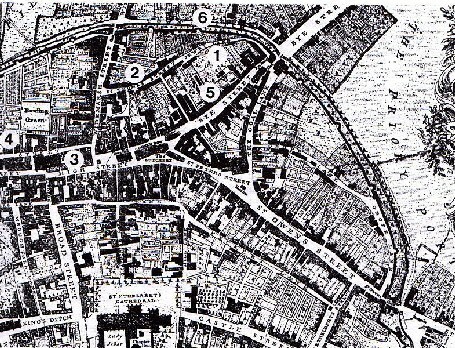 The area of the Jewry and the ancient street plan was obliterated by a shopping development in the 1980s, in spite of numerous objections. Joe Hillaby concluded, "In a city littered with historic notices, and despite recommendations, there is nothing to honour the memory of this remarkable community. Is the city, one wonders, still beset by a sense of guilt - or is it just indifference?" These trees were planted in the Negev.